1. NO PURCHASE NECESSARY. PURCHASE WILL NOT INCREASE THE CHANCES OF WINNING. ALL FEDERAL, STATE, LOCAL AND MUNICIPAL LAWS AND REGULATIONS APPLY. THE JIM HUDSON $10,000.00 GIVEAWAY IS OPEN ONLY TO RESIDENTS OF THE STATE OF SOUTH CAROLINA WHO ARE EIGHTEEN (18) YEARS OR OLDER AS OF APRIL 8, 2019. VOID WHERE PROHIBITED. 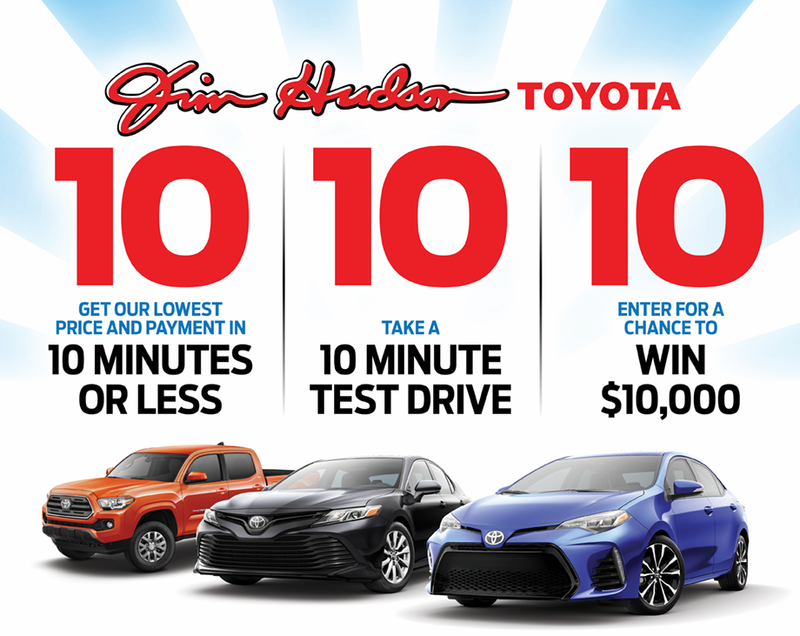 Enter by taking a test drive at Jim Hudson Superstore, Inc. d/b/a Jim Hudson Toyota’s dealership located at 970 Columbiana Drive, Irmo, South Carolina 29063 and filling out and submitting an entry form on the dealership’s Website through designated employees at the dealership. Limit one (1) entry per person per calendar month. Only qualified entrant forms received in the months of April, May and June 2019 will be eligible for the June 30, 2019 grand prize drawing. Only qualified entrant forms received in the months of July, August, and September 2019 will be eligible for the September 30, 2019 grand prize drawing. Only qualified entrant forms received in the months of October, November and December 2019 will be eligible for the December 31, 2019 grand prize drawing. An eligible entrant may only win a total of one (1) Grand Prize during the period of the JIM HUDSON $10,000.00 GIVEWAY. Neither the Sponsor nor any of its agencies are responsible for lost, damaged, or delayed entries. All materials submitted become the property of the sponsoring dealership and none will be returned. 2. The JIM HUDSON $10,000.00 GIVEAWAY is sponsored by Jim Hudson Superstore, Inc. d/b/a Jim Hudson Toyota located at 970 Columbiana Dr., Irmo, SC 29063 (hereinafter referred to as “Sponsor”). 3. The JIM HUDSON $10,000.00 GIVEAWAY offers entrants a chance to win $10,000.00 (the “Grand Prize”) at drawings to be held on June 30, 2019, September 30, 2019 and December 31, 2019. By participating in the JIM HUDSON $10,000.00 GIVEAWAY, each entrant unconditionally agrees to abide by the Official Award Rules and the decisions of Sponsor, which shall be final and binding in all matters relating to the JIM HUDSON $10,000.00 GIVEAWAY. 4. There will be a total of three (3) Grand Prizes awarded. There will be one (1) Grand Prize awarded on or around June 30, 2019, one (1) Grand Prize awarded on or around September 30, 2019 and one (1) Grand Prize awarded on or around December 31, 2019. If a winner is disqualified, Sponsor reserves the right to determine an alternate winner by conducting a random drawing of the remaining qualified entrants’ forms. Winner must hold a valid South Carolina Driver License proving Winner is a resident of the State of South Carolina and at least 18 years of age. Grand Prizes are not transferable or exchangeable for any other prize. 5. Grand Prize is provided by Sponsor. Odds of winning depend upon the number of eligible entries received by Sponsor’s dealership in Columbia, South Carolina. 6. EACH GRAND PRIZE WINNER IS SOLELY RESPONSIBLE FOR ANY AND ALL EXPENSES AND TAXES ASSOCIATED WITH WINNING THE GRAND PRIZE, INCLUDING, BUT NOT LIMITED TO ALL LOCAL, STATE AND FEDERAL TAXES ASSOCIATED WITH THE RECEIPT OR USE OF THE GRAND PRIZE. Winner must take delivery and must take possession of the Grand Prize no later than fourteen (14) days after receiving notice that the Grand Prize is ready to be claimed. Failure of the Winner to take possession within such time will result in disqualification. Grand Prize Winner must provide a valid South Carolina driver’s license prior to taking delivery of the Grand Prize. All taxes and any other expenses not specifically identified in these Official Rules are the sole responsibility of each Winner. All Grand Prize Winners will receive an IRS Form 1099 for the $10,000.00 Grand Prize from Sponsor. 7. The contest will begin on April 8, 2019 and ends on December 31, 2019, at 8 PM. The Grand Prize Winners will be selected in a random drawing of all eligible entries to be held at 8 PM on June 30, 2019, September 30, 2019 and December 31, 2019. WINNER NEED NOT BE PRESENT AT THE DRAWINGS TO WIN. If a potential winner is not present at the drawing, such potential winner will be notified by e- mail and/or phone at Sponsor’ discretion on or about June 30, 2019, September 30, 2019 and December 31, 2019. If the Sponsor cannot locate a winner within seven (7) days of the date of attempted notification, the Grand Prize may be deemed by Sponsor to be forfeited, in Sponsor’s sole discretion. Potential winners shall be required to complete, sign and return to Sponsor an Affidavit of Eligibility and a liability and publicity release (unless otherwise permitted) and provide Sponsor with proof of identity within seven (7) days of attempted notification. If a winner cannot be contacted or located within seven (7) days, fails to complete, sign and return the Affidavit of Eligibility and a liability and publicity release within the required time period, is not in compliance with these Official Award Rules, or a prize notification is returned as undeliverable, Grand Prize may be deemed by Sponsor to be forfeited, in Sponsor’s sole discretion. Sponsor is not responsible for any change of email address, mailing address or telephone number of entrants. Grand Prize Winner must pick up Grand Prize in person during normal business hours within fourteen (14) days of verification of eligibility. Sponsor may require a valid South Carolina driver’s license prior to winner taking possession of the Grand Prize. 8. The JIM HUDSON $10,000.00 GIVEAWAY is open to legal residents of the South Carolina who are 18 years of age or older with a valid South Carolina driver’s license. Employees and immediate families of employees of Sponsor and their respective affiliates, subsidiaries, advertising and promotion agencies are ineligible. This promotion is void where prohibited by law and is subject to federal, state and local regulation. The decisions of the Sponsor regarding this contest are final. To be removed from the mailing list, write to: Jim Hudson Superstore, Inc. d/b/a Jim Hudson Toyota, 970 Columbiana Drive, Irmo, SC 29063. 9. The name of the winners will be disclosed as provided by law. For the names of the winner, send a self-addressed, stamped envelope to: Jim Hudson Superstore, Inc. d/b/a Jim Hudson Toyota, 970 Columbiana Drive, Irmo, SC 29063. 10. Acceptance of Grand Prize offered constitutes permission to use winner's name, biographical information and/or likeness for purposes of advertising and promotion without further compensation. 11. By accepting the Grand Prize, Winners release Sponsor, their advertising and promotional agencies and each of the Sponsor’s officers, directors, agents and employees, from any and all liability however caused with respect to this contest, the prize or any claims, demands, actions or causes of action of any kind whatsoever for injuries, damage, or losses to persons or property which may be sustained in connection with receipt, ownership, or use of any Grand Prize or while preparing for, participating in, and/or traveling to or from any Grand Prize related activity and Winner also acknowledges that said parties have neither made, nor in any manner are responsible or liable for, any warranty, representation, promise or guaranty, express or implied, relative to the Grand Prize or otherwise. 12. By participating, entrant agrees to be bound by these Official Award Rules and the decisions of Sponsor, which shall be final in all respects. Sponsor reserve the right to disqualify persons found tampering with or otherwise abusing any aspect of this contest, as determined solely by Sponsor. The decisions of Sponsor, the interpretation of these Official Award Rules and all other aspects of this contest shall be binding and final in all respects. Sponsor will not be responsible for typographical, printing website or other inadvertent errors in these Official Award Rules or typographical errors or in other materials related to the JIM HUDSON $10,000.00 GIVEAWAY. 13. In the event that any potential winner (a) fails to satisfy any eligibility or verification requirement herein, (b) declines to accept the Grand Prize, or (c) is otherwise determined to be ineligible, Sponsor may, in its discretion, disqualify that individual. In the event a potential winner is disqualified, an alternate winner will be chosen by random drawing to be held as soon as reasonably practical after initial potential winner is determined to be ineligible. Alternate winners are subject to all eligibility requirements and restrictions of these Official Award Rules.